Naim boss Paul Stephenson may say ‘We’re glad 2014 is behind us, and we can move on’ – he admits times were tough last summer, mainly due to global economic and political unrest –, but the company is still upbeat after recording its best-ever sales last year, with record months in the last quarter. Giving their view of the state of things in Salisbury this week at the launch event for the new NAC-N 272 network player/preamp/DAC, Stephenson and Naim marketing and communications director Ryan Latham reported on the success of the company’s two most recent products – the all-in-one mu-so system and the flagship Statement amplifier – and gave visitors the chance to see the much-talked about super-amplifier being assembled. 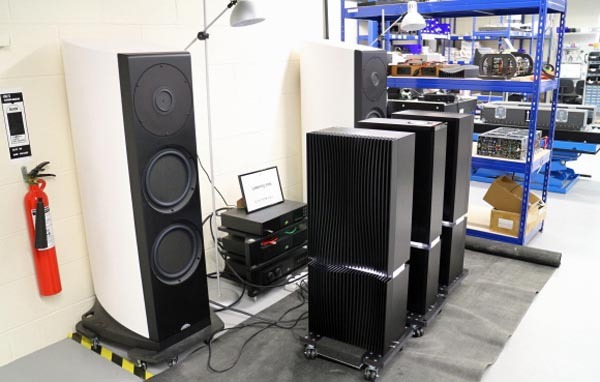 Naim’s record year meant clocking up sales of £21m, with Statement orders up 50% on expectations, and well on target to meet the planned production of 100 sets. Mu-so (above) is doing even better, with sales to date of three times the company’s initial forecast, with the result that the order book is now full until June of this year, and the system on back-order until then. Naim’s pleased that those sales have been achieved both through new channels, such as Apple stores and John Lewis, and its existing dealer-base, and even better that 71% of mu-so buyers are new to the brand, with some expressing an intention to buy more Naim equipment in the future. What’s more, the company is still recruiting more staff, and both in production and R&D: Trevor Wilson, who heads up research and development at Naim, explained that out of a total of around 35 people in his department, there are now nine staff working on core product software R&D, four more purely working on apps, and ‘an army of contractors’. 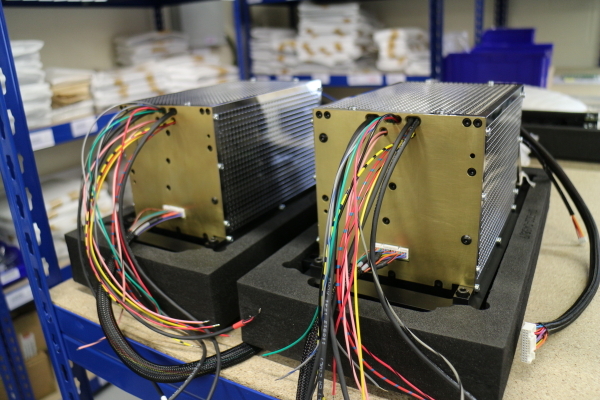 Production of Statement started later than intended, coming up to speed in October last year, not least due to the complexity and sheer mass of the products, the latter requiring the installation of special equipment just to move the three parts of the amplifier – the preamp and two monoblocs in each system – between assembly stations, let alone from the factory to the final buyer. 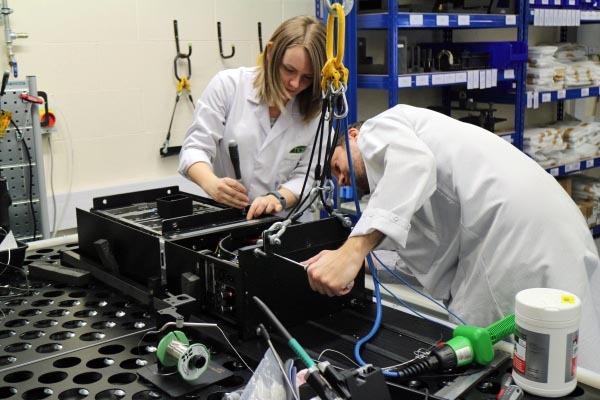 At Naim HQ a dedicated area has been put together to build the amplifier, away from the main assembly floor: here a small team builds up the preamp, power amp and power supply modules before fitting them into the main chassis of each section, then fitting the distinctive finned heatsinks. 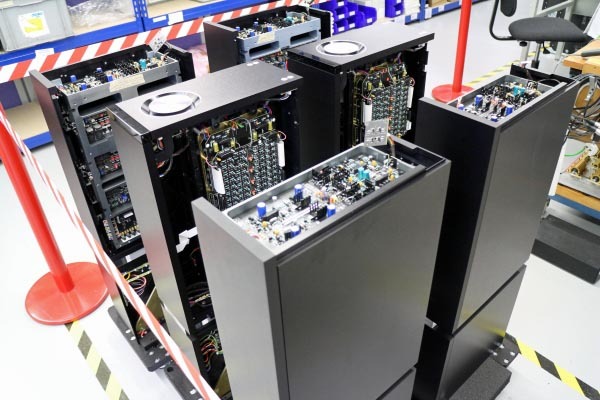 Touchscreens help guide the assembly, with staff able to rotate the views of the amplifier schematics in three dimensions to check any aspect of the design and engineering and – as with all of the company’s hi-fi separates – there’s a high degree of hand-assembly, plus extensive testing and quality control. 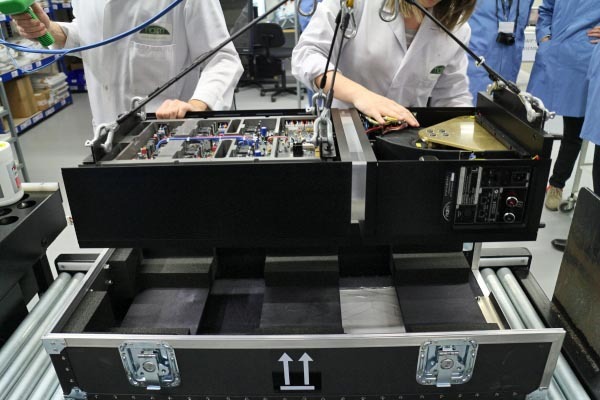 Final assembly, however, brings those problems of size and weight, not that the sub-assemblies are actually featherweight: special endpieces have been made to bolt onto the main ‘building blocks’ to move them around the assembly area. Note also the use of essential physical test equipment (above)! 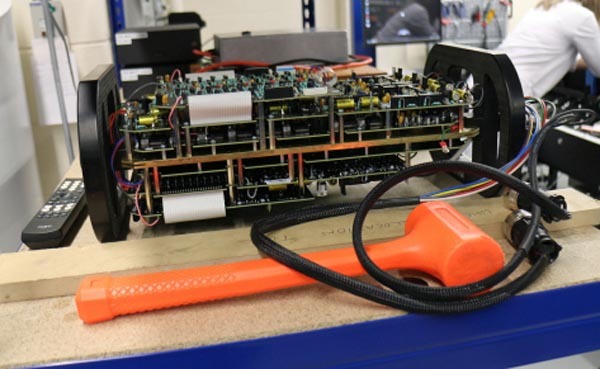 However, once the amps are assembled, using the preamp, power amp and power supply modules seen above, heavy lifting gear is the only solution. 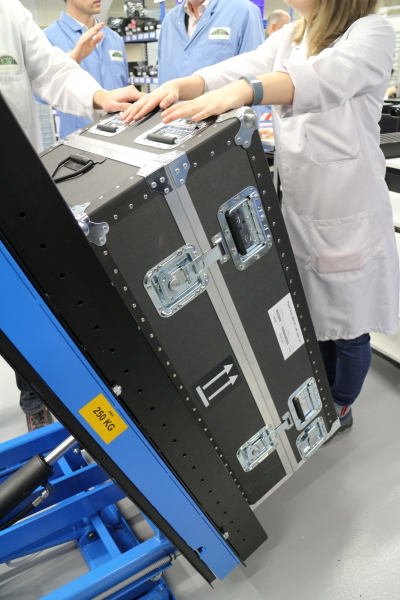 Temporary mounts are attached to accept shackles from a ceiling mounted hoist, which lifts the amplifier from the assembly station and allows it to be guided into the waiting lower half of a custom-made flight case. Some extra packing pieces are then installed before the upper half of the case is attached, and then a lift tilts the whole shebang through 90 degrees – to the sound of the Thunderbirds theme from some of the visitors – and sets it onto its transport castors in an upright position. 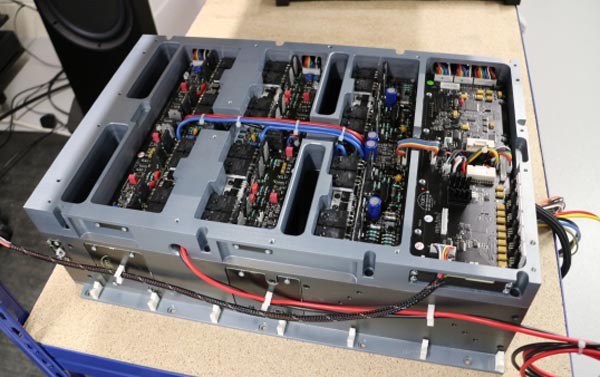 The flight case stays with each part of the amplifier until it is delivered and installed at the customer’s home, ensuring this very expensive – £135,000 for a set – and heavy (101kg a pop for the NAP S1 power amps, and 61.5kg for the NAC-S1 preamp) amplifier arrives at its destination in perfect condition. 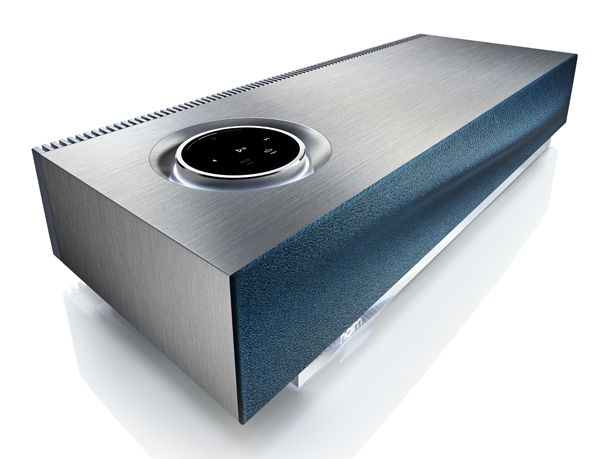 Shipping an amplifier of that size and weight around the world is just another headache Naim has had to overcome, according to Stephenson – though you get the impression that, given the good shape in which the company finds itself at the beginning of 2015, he thinks it might just have been worth it.